After three years of persistent drought, the government is warning that “Day Zero” — when it will be forced to turn off most faucets — will be May 11. That’s when reservoirs and water sources are forecast to hit 13.5% capacity, at which point the city is expected to move most residents to a strict water-rationing system. As Cape Town’s reservoirs of fresh water get dangerously close to dry, locals are beginning to store water in jugs and fill up at spring-fed taps set up by local breweries. Those who can afford it are boring mini backyard wells to collect private water stashes, and some hotels are investing in pricey desalination plants to make ocean water drinkable. The drought is the region’s worst in over a century. Theewaterskloof Dam. Photo Rodger Bosch/ AFP/ Getty Images. The Theewaterskloof Dam, the city’s largest, is just 13% full. Long-term forecasters say it’s impossible to predict how long the crisis will last. Cape Town’s population has also been growing rapidly, compounding the effects of the three-year drought. After weeks of failed attempts, there’s some evidence that people are finally starting to heed the city’s calls. 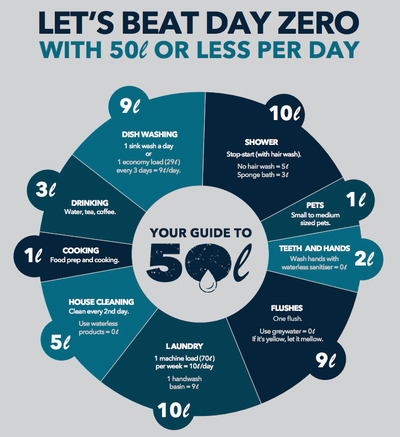 The city says 55% of its residents are now using less than 87 litres of water a day at home. But that won’t be enough to avoid a catastrophe. “Only if each of us reduces our daily use down to 50 litres or less, and the City implements the necessary projects, will we avoid Day Zero,” the city’s website says. Local beer bottlers are opening up their natural spring taps so people can collect free water, off the city’s grid. Cape Town residents queue to refill water bottles at Newlands Brewery Spring Water Point on January 30, 2018. Photo: Morgana Wingard/ Getty Images. Only one “alternative water source” project in the works is running on schedule: a waterfront hotel’s plan to build a private plant to treat ocean water. The government is worried that if people can’t conserve enough water to avoid the shutoff, anarchy will erupt. Diminishing water supplies may lead to the taps being turned off for the four millions inhabitants of Cape Town. Photo: Morgana Wingard/ Getty Images. If “Day Zero” arrives, though, not all the taps will be turned off. People who live in settlements and shantytowns where there’s no running water in homes will still have access to the city’s supply from spigots. But everyone else will be limited to 25 litres a day. Photo: Morgana Wingard/ Getty Images. They will have to collect their water ration from one of the 200 water distribution points the city plans to set up. Western Cape Premier Helen Zille wrote in the South African newspaper the Daily Maverick that “if every family sends one person to fetch their water allocation, about 5,000 people will congregate” at each tap per day. “As things stand, the challenge exceeds anything a major city has had to face anywhere in the world since the Second World War or 9/11,” Zille wrote. 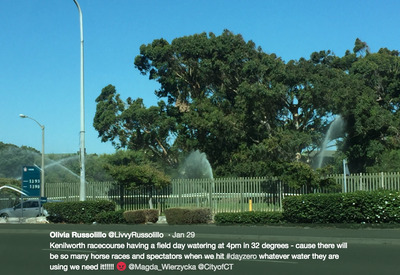 An activist addresses hundreds of people taking part in a protest against the way the Cape Town city council has dealt with issues around water shortages. Photo: Rodger Bosch/ AFP/ Getty Images. “I personally doubt whether it is possible for a city the size of Cape Town to distribute sufficient water to its residents, using its own resources, once the underground water-pipe network has been shut down,” she said. It’s also telling people to shower less often and use hand sanitizer instead of washing their hands some of the time. But Cape Town isn’t the only city in water trouble — the World Wildlife Fund estimates that by 2025, two-thirds of the world could be dealing with water shortages. As droughts fuelled by climate change become more frequent and developing cities become more packed with people, some freshwater sources could be threatened.